In 1949, Republic created a swept wing version of the F-84 hoping to bring performance to the F-86 level. The last production F-84E was fitted with a swept tail, a new wing with 38.5 degrees of leading edge sweep and 3.5 degrees of anhedral, and a J35-A-25 engine producing 5,300 pound-force (23.58 kN) of thrust. 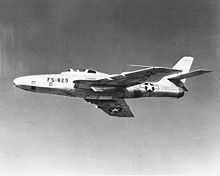 The aircraft was designated XF-96A. It flew on 3 June 1950 with Otto P. Haas at the controls. Although the airplane was capable of 602 knots (693 mph, 1,115 km/h), the performance gain over the F-84E was considered minor. Nonetheless, it was ordered into production in July 1950 as the F-84F Thunderstreak. 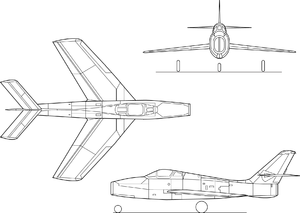 The F-84 designation was retained because the fighter was expected to be a low-cost improvement of the straight-wing Thunderjet with over 55 percent commonality in tooling. In the meantime, the USAF, hoping for improved high-altitude performance from a more powerful engine, arranged for the British Armstrong Siddeley Sapphire turbojet engine to be built in the United States as the Wright J65. To accommodate the larger engine, YF-84Fs with a British-built Sapphire as well as production F-84Fs with the J65 had a vertically stretched fuselage, with the air intake attaining an oval cross-section. Production delays with the F-84F forced USAF to order a number of straight-wing F-84Gs as an interim measure. Production quickly ran into problems. Although tooling commonality with the Thunderjet was supposed to be 55 percent, in reality only 15 percent of tools could be reused. To make matters worse, the F-84F utilized press-forged wing spars and ribs. At the time, only three presses in the United States could manufacture these, and priority was given to the B-47 Stratojet bomber over the F-84. The YJ65-W-1 engine was considered obsolete and the improved J65-W-3 did not become available until 1954. When the first production F-84F finally flew on 22 November 1952, it differed from the service test aircraft. It had a different canopy which opened up and back instead of sliding to the rear, as well as airbrakes on the sides of the fuselage instead of the bottom of the aircraft. The aircraft was considered not ready for operational deployment due to control and stability problems. Since early aircraft suffered from accelerated stall pitch-up, F-84F-25-RE introduced an all-moving tailplane. A number of aircraft were also retrofitted with spoilers for improved high-speed control. As a result, the F-84F was not declared operational until 12 May 1954. Project Run In completed operational tests in November 1954 and found the aircraft to be to USAF satisfaction and considerably better than the F-84G. However, ongoing engine failures resulted in the entire fleet being grounded in early 1955. Also, the J65 engine continued to suffer from flameouts when flying through heavy rain or snow. As the result of the problems, the active duty phaseout began almost as soon as the F-84F entered service in 1954, and was completed by 1958. Increased tensions in Germany associated with construction of the Berlin Wall in 1961 resulted in reactivation of the F-84F fleet. In 1962, the fleet was grounded due to corrosion of control rods. A total of 1,800 man hours was expended to bring each aircraft to full operational capacity. The aircraft were retired from active service in 1964. Stress corrosion forced retirement of ANG F-84Fs in 1971. In what is probably one of the very few air-to-air engagements involving the F-84F, two Turkish Air Force F-84F Thunderstreaks shot down two Iraqi Il-28 Beagle bombers that crossed the Turkish border by mistake during a bombing operation against Iraqi Kurdish insurgents. This engagement took place on 16 August 1962. Picture: RF-84F Thunderflash, the reconnaissance version of the F-84F Thunderstreak. Several modified Thunderflashes were used in the FICON project. The Thunderstreak suffered from the same poor takeoff performance as the straight-wing Thunderjets in spite of having a more powerful engine. In reality, almost 700 pounds-force (3.11 kN) or 10 percent of total thrust was lost because the J65 was installed at an angle and its exhaust had a prominent kink. On a hot day, 7,500 feet (2,285 m) of runway were required for takeoff roll. A typical takeoff speed was 160 knots (185 mph, 300 km/h). Like the Thunderjet, the Thunderstreak excelled at cruise and had predictable handling characteristics within its performance envelope. Like its predecessor, it also suffered from accelerated stall pitch-up and potential resulting separation of wings from the airplane. In addition, spins in the F-84F were practically unrecoverable and ejection was the only recourse below 10,000 feet (3,000 m). With the appearance of the F-105 Thunderchief, the Thunderstreak became known as the Thud's Mother. 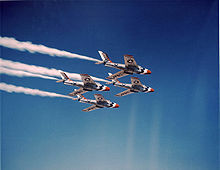 By the mid-1960s, the F-84F was replaced by the F-100 Super Sabre and the RF-84F by the RF-101 Voodoo in USAF units, being relegated to duty in the Air National Guard. 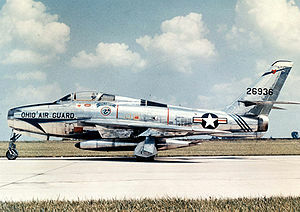 The last F-84F Thunderflash retired from the ANG in 1971. Three Hellenic Air Force RF-84Fs that were retired in 1991 were the last operational F-84s. Richard Bach, who later wrote the bestseller Jonathan Livingston Seagull, was an ANG F-84F pilot who was once activated for duty in Europe. His first book, Stranger to the Ground, described in detail what it was like to fly the Thunderstreak in the course of an operational flight at night from England to France in adverse weather. - Two swept-wing prototypes of the F-84F, initially designated YF-96. - Swept wing version with Wright J65 engine. Tactical Air Command aircraft were equipped with Low-Altitude Bombing System (LABS) for delivering nuclear bombs. 2,711 built, 1,301 went to NATO under Mutual Defense Assistance Program (MDAP). - 25 RF-84Fs were converted to be carried, and launched from the bomb bay of a GRB-36F bomber as part of the FICON project. The aircraft were later redesignated RF-84K. - Two F-84Fs were converted into experimental aircraft. Each was fitted with a Allison XT40-A-1 turboprop engine of 5,850 shaft horsepower (4,365 kW) driving a supersonic propeller. Ground crews dubbed the XF-84H the Thunderscreech due to its extreme noise level. - Two F-84Fs were converted into YF-84J prototypes with enlarged nose intakes and a deepened fuselages for the General Electric J73 engine; the YF-84J reached Mach 1.09 in level flight on 7 April 1954. The project was cancelled due to the excessive cost of conversion of existing F-84Fs. F-84F (s/n 52-6526) is on display at the National Museum of the United States Air Force in Dayton, Ohio. It was flown to the Museum in 1970 following its assignment in the Ohio Air National Guard. During its career it served in England, Greece, Alaska, and the continental U.S. It was one of 200 fighters which participated in the mass deployment of aircraft across the Atlantic Ocean to Europe in November 1961 in response to the Berlin Crisis. F-84F is on display in a park in Indian Springs, Nevada; tail number 1776, painted in Thunderbird colors. F-84F of the Hellenic Air Force is on display at the Athens War Museum. F-84F is on display at the National Museum of Science and Technology in Milan. RF-84K (s/n 52-7266) at Wings Over the Rockies Air and Space Museum, Denver, Colorado. in the Restorations Department. Picture: Orthographically projected diagram of the Republic F-84F Thunderstreak. 1. ^ a b c d e f g h i j k l m n Knaack, Marcelle Size. Encyclopedia of US Air Force Aircraft and Missile Systems: Volume 1 Post-World War II Fighters 1945-1973. Washington, DC: Office of Air Force History, 1978. ISBN 0-912799-59-5. 2. ^ Cooper, Tom. "Europe & Cold War Database: Cyprus, 1955-1973." Air Combat Information Group, 26 October 2003. Retrieved: 8 September 2009. 3. ^ a b c d Higham, Robin and Carol Williams. Flying Combat Aircraft of USAAF-USAF (Vol.2). Rockville, Maryland: Air Force Historical Foundation, 1978. ISBN 0-8138-0375-6. 4. ^ United States Air Force Museum 1975, p. 56. 6. ^ Dorr, Robert F. and David Donald. Fighters of the United States Air Force. London: Temple Press Aerospace, 1990. ISBN 0-600-55094-X. Hiltermann, Gijs. "Republic F-84F Thunderstreak." Vliegend in Nederland 1 (in Dutch). Eindhoven, Netherlands: Flash Aviation, 1988. ISBN 978-9-0715-5304-2. United States Air Force Museum booklet. Air Force Museum Foundation. Dayton, Ohio: Wright-Patterson AFB, 1975.